We were taking a short walk on Saturday afternoon when I spotted a row of trees that were all dead. Why were all these trees in the parking lot completely leafless. This is July and trees should have leafed out by now. If there were not leaves, then something was obviously not right. Walking towards them, I was thinking, these look like ash trees. As we go closer, sure enough, these were a row of ash trees. 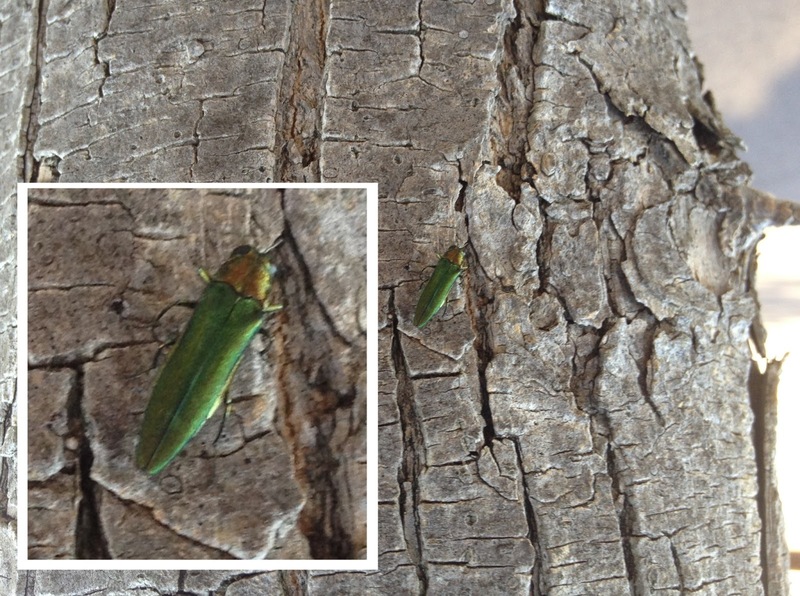 Emerald Ash borer. I looked for holes in the trunk, but didn`t see any on the first couple of trees. But looking closer, small holes could be seen in the bark of the trunks. As we wandered through the parking lot, we came across some trees that were severely weakened and chlorotic on top but with a lot of new healthy grow in sprouts coming off the lower part of the trunk. Unfortunately, I did not take a photo of the top part of the tree - this would show the contrast between the affected (read infected) parts and the still healthy trunk that was sprouting new shoots. However as we walked along this row of trees, I noticed that there were the Emerald Ash Borer adults on the trunks. I picked up a small pebble and crushed several. There were even a pair of them, one on top the other, mating. Looks like egg laying season is just around the corner. 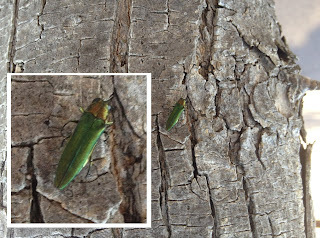 There are a couple of options for protecting your ash trees. Treeazin can be injected into the trees. Treeazin contains Neem oil from India. This is an organic product that disrupts the normal functions of insects. Health Canada has banned the use of Neem in many other horticultural products. Neem can be used in the United States where it is accepted as a GRAS (generally accepted as safe) product. The other product that can be used is Acecaps. Acecaps contain a systemic insecticide Orthene. To use Acecaps a small hole is drilled into the base of the tree, then a capsule is inserted into the trunk. As moisture is moved up the trunk, the insecticide contained in the capsule is translocated up through the tree`s plumbing system. Acecaps should protect your tree for two years. Applications should be made at this time of year. Contact a arborist to evaluate your situation.